Blurb: YOU DIE WHEN YOU DIE . . .
You can’t change your fate – so throw yourself into battle, because you’ll either win or wake up drinking mead in the halls of your ancestors. That’s what Finn’s tribe believe. But when their settlement is massacred by a hostile tribe and Finn and several friends, companions and rivals make their escape across a brutal, unfamiliar landscape, Finn will fight harder than he’s ever fought in his life. He wants to live – even if he only lives long enough to tell Thyri Treelegs how he feels about her. The David Gemmell Award nominated author of Age of Iron returns with You Die When You Die – in which a mismatched group of refugees battle animals and monsters, determined assassins, depraved tribes, an unforgiving land and each other as they cross a continent to fulfill a prophecy. So, I have mixed feelings about this book. Don’t get me wrong: I did enjoy You Die When You Die by Angus Watson. I definitely have plans to read the sequel, The Land You Never Leave, and I honestly hope that I’ll enjoy the sequel more than I did the first book. But it’s not that I didn’t enjoy it, it just…wasn’t what I was expected, honestly. Granted, that might be a little unfair, considering I didn’t know too much about this book to begin with, even reading the blurb on the back. 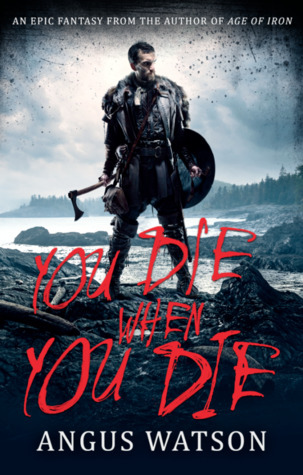 But it seemed really interesting, based off the Vikings (which I was absolutely down for) and the cover was fantastic (not to mention a very handsome hero I was hoping to be able to root for). So I was thinking it was going to be more of an epic quest with a hero to fall in love it. We did get the epic quest part and honestly, with the ending being so unexpected (in a good way), I’m even more curious to see where the quest leads next. It’s the likeable hero part that I didn’t really get. And I think that’s what is dragging me with this story, a little bit. But I liked very few of the characters we were introduced to. I did love some: Sassa and Wulf, Ottar and Freydis, Erik the Angry and the entire Owsla warriors. But there were multiple characters from the Hardworkers tribe that drove me up the wall and I didn’t understand why the rest of them put up with their scheming, their anger or their personalities. It also seemed kinda odd how many of them died in such…almost random seeming ways? Especially when they each seemed to have subplots that were set up to do something more and then nothing happened, because they died (I wasn’t bummed about the dying part, I was just confused on why we started those subplots that seemed to not go anywhere)? I dunno, it just kinda irked me a little bit, because we followed these Hardworkers through so much and there were only a few that I really grew to root for. I…didn’t like him at all. I honestly just found him annoying. And the few heart-to-hearts he seemed to have, with Sassa and Garth, all the points they made, I actually agreed with? I saw Finn as self-centered, annoying and his treatment of Bodil made me lose all respect for him completely. Granted, I realize he’s still young and he has a lot to figure out, but…I dunno, he just really irked me and made it practically impossible for me to root for him in any such way. If that’s meant to be him on the cover, I Definitely didn’t see it. To me, he felt so much younger and so…whiny? Weak? Self-righteous? Considering he’s one of the main characters, it just made the book feel a little slow, especially towards the beginning, before the quest began. I will say that the end definitely picked up and, like I mentioned, the twist definitely has me curious about the sequel and I have no doubt that I’ll pick it up and see what happens next. I guess it was just more comical than I was expecting and some of it seemed a bit over the top and I was thinking of something a little more serious when I started to read it. I think, knowing now the kind of humor that’s involved, mixed with the vulgarity and the gore (neither of which I minded at all), I’ll know much more what to expect in book two, so that’s why I think I’ll enjoy it more. I just had different expectations (where they came from is beyond me), which is why I think this book just felt a little off and a little slow, to me, with a lot to accumulate to. That being said, it was really well written, with a lot of distinct voice and great worldbuilding and because of that, I’m also really curious to check out Watson’s other series. And I’m hopeful that this series will pick up a little more for me, too, with the subsequent books (especially because those covers are just darn gorgeous). I think I feel the worst for it because I have no idea where my different expectations came from (perhaps the cover? I dunno). But I’m honestly looking forward to checking out the second one and see what happens next. And now that I’m sort of aware of the writing style and tone, I’m hoping to enjoy it much more! I do want to check out his Iron Age trilogy, too, because it seems really interested (and you were blurbed for it, which means it must be good!). Oh yeah, I was pretty surprised when I went to the book store and picked up the book to see my quote on the back. I hadn’t known! That had to be the most surreal feeling!! I say it and I was like, “Eep, I “know” her!” and thought it was really neat. Though mental that they didn’t tell you!